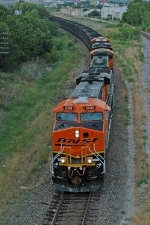 Description: 5980 was waiting for BNSF 2230 to get his southern posterior into Saginaw Yard, so it could move forward. Description: My second attempt at this shot: the train that brings the coal, the plant that burns it to generate electricity, and the wires that carry the power. Description: An empty departs the plant. Description: Norfolk Southern 8765 is parked near the station while BNSF 5980 leads a train by at Livingston, Montana. 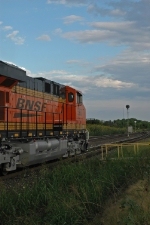 Description: BNSF ES44AC leads a train past Norfolk Southern 8765 near the preserved Northern Pacific station at Livingston, Montana. 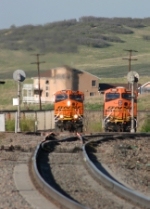 Description: BNSF ES44AC 5980 and SD70MAC 8917 move a train past the preserved Northern Pacific station area in Livingston, Montana.